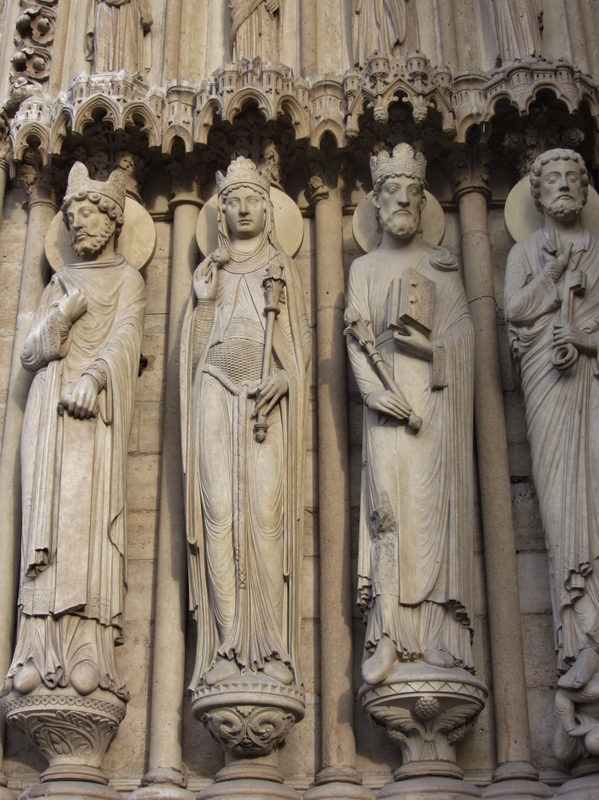 Statues from the Portal of St. Anne, West Facade, Exterior of Notre-Dame de Paris, Paris, France. The now cream colored statues (1845 restorations due to damage during the French Revolution) would originally have been painted. They represent a king, the Queen of Sheba, King Solomon and Saint Peter. Wouldn’t it have been amazing to see all the old statues out there back when they were originally made- covered in vibrant colors? Without, they’re still gorgeous- so much detail. I agree. Though I think modern tastes would be appalled. We are so used to thinking of churches as solemn. I wonder if it would change our view of religion. 🙂 The Parthenon was also painted. It must have been a sight to behold. That’s an interesting thought. It may very well have caused different attitudes.